Leading experts in all fields say that morons and assholes now have more influence on world events and your personal life, than ever before. The Christian Science Monitor reported yesterday that a battle of nerves was continuing off the coast of Somalia, as the US and Russia turned up the heat on a group of Somali pirates aboard a hijacked cargo vessel. USA Today reported yesterday that Democrat Barack Obama and Republican John McCain returned to a somber capital Wednesday and pushed an economic recovery plan through Congress. Meanwhile it was same-old same-old in Baghdad, where Associated Press reported yesterday that compassionate suicide bombers targeted Shiite worshippers as they left morning prayers Thursday at two Baghdad mosques, killing 24 people and wounding more than 50 others. Some pundits say common sense is no longer common and morons rule. 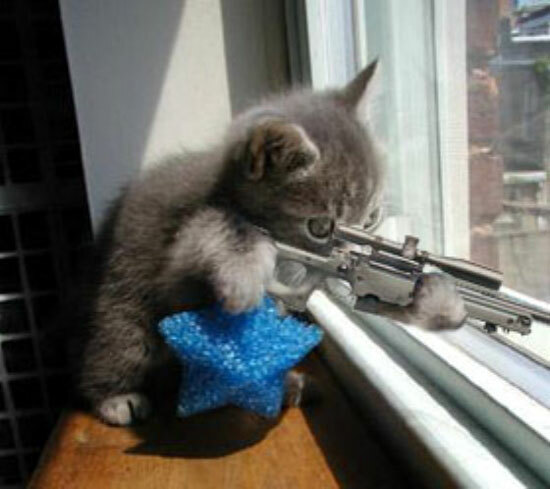 Even kittens are going bad. USA Today reported that McCain and Obama arrived in the Senate chamber two days after the House rejected the $700 billion bailout proposal in a historic vote that sent markets tumbling around the world and prompted renewed calls for action. USA Today did not report why the Senate then leapt at the chance to pass the massive bailout bill that contains more pork than the version the House voted down. According to an analyst who refused to be identified, the Senate believes that if the bill contains more gifts for a larger group of Americans, everyone will like the bill better. The unidentified individual said that the Senate had suspended the notion that debt was bad and decided that a bigger party was needed to make taxpayers feel better. Associated Press reported that in keeping with the century’s old tradition of blowing up people some Muslim’s disagree with, that 24 Shiite worshippers leaving a mosque in Baghdad were blown to death and 50 injured. Among the dead were two children, three women and a man, police in Diyala province said. Another woman and her small child were injured. Muslim terrorists backed by the small country of Iran said that indiscriminate murder is a long standing and accepted approach to solving disagreements, and encouraged more of the same throughout the world, with particular encouragement for those in Western democracies polluted by respect and tolerance. Some people say that traditional terror is better than traditional compassion. In related news on flailing common sense and the continuing decline of reason, Reuters reported yesterday that Rosie O’Donnell is returning to television as host of a live variety show on NBC. The network will air “Rosie’s Variety Show” as an hour-long special the night before Thanksgiving, with an eye toward expansion to a full series. Reportedly Rosie’s belief that the US bombed the buildings in New York on 9-11 resonates with the NBC elite, and they feel that putting Rosie in a position to promote her views is the thing to do.